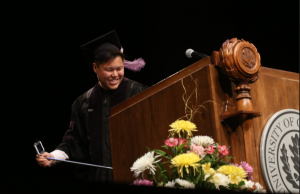 Dr. Jeffrey Pan was Honored as the Doctor of Dental Medicine's Commencement Student Speaker of University of Connecticut Health Center's Graduation Commencement Ceremony. He then attended Boston University Henry M. Goldman School of Dental Medicine's Post-Doctoral program in Advanced Education in General Dentistry (A.E.G.D.). Dr. Jeffrey Pan has advanced training in Dental Implants, Cosmetic and Restorative Dentistry. During the Certificate of Advanced Graduate Studies (C.A.G.S.) Convocation at Boston University School of Dental Medicine, Dr. Jeffrey Pan was the recipient of the distinguished Award in Advanced Education in General Dentistry for Outstanding Clinical Performance. 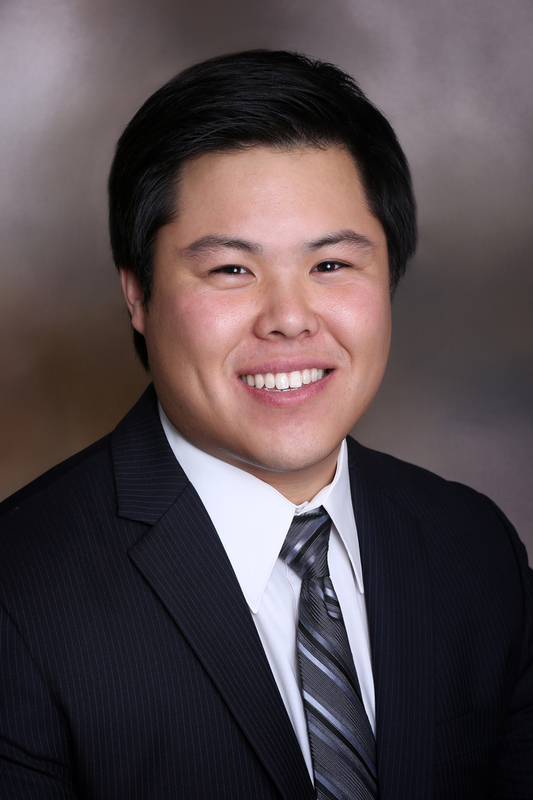 In 2016, Dr. Nelson Pan and Dr. Debra Pan were overjoyed to announce that their oldest son, Advanced-trained Dr. Jeffrey Pan, joined Pan Dental Care as our In-house Dental Implantologist, Cosmetic & Restorative Dentist with a Post-Doctoral Certificate in Advanced Education in General Dentistry providing the most innovative and advanced techniques in Computerized CAD/CAM Digital Dentistry. 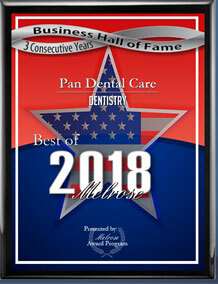 Pan Dental Care's Family & Cosmetic Dentistry, Orthodontics, Pediatric Dental Care for Children, Periodontics, Dental Implantology private practice have all State-of-the-art Sterilization and "Drill-less" Dentistry. The Doctors are proud to provide an Advanced Computerized Digital Dentistry Facility for the highest-quality comfortable dental care available. Specialty equipment includes computerized technology for "Single-Visit" Porcelain Crown and Veneers CEREC 3D, Galileos 3-D digital scans, Biolase Laser for gentle hard and soft tissue treatment, Instant Computerized Digital X-rays, Rotary Root Canal Computerized Treatment, Drill-less Air Abrasion Unit, Intraoral Camera, Smooth Electric Handpieces, Invisalign, Zoom 2! Teeth Whitening and much more. 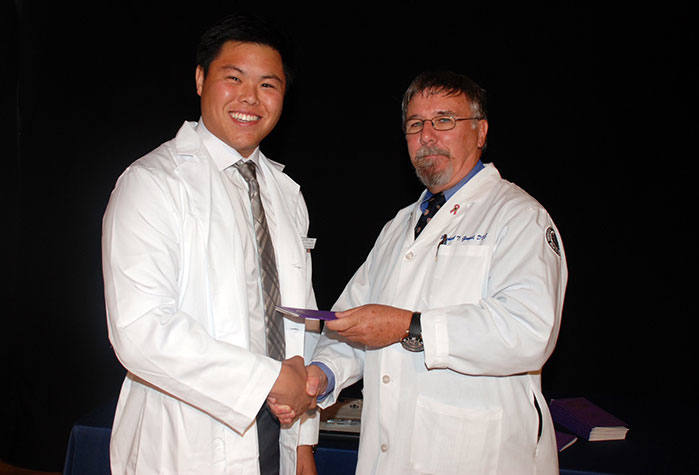 Jeffrey Pan - dental student speaker for @UConnHealth commencement ceremony May 9. 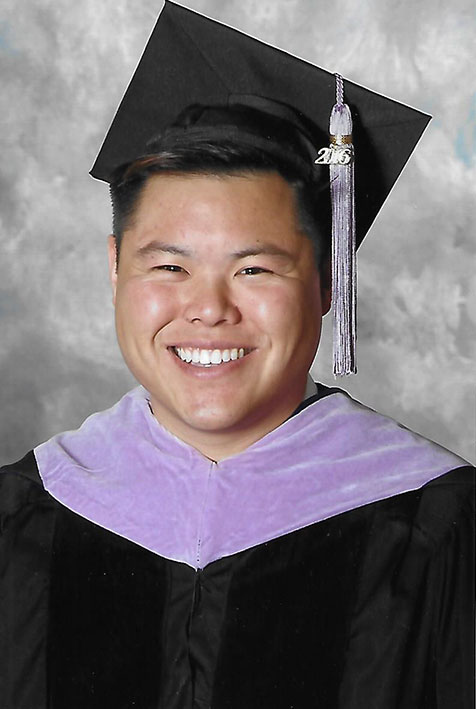 Graduating dental student Jeffrey Pan is one of the students speaking during the 2016 UConn Health Commencement ceremony. 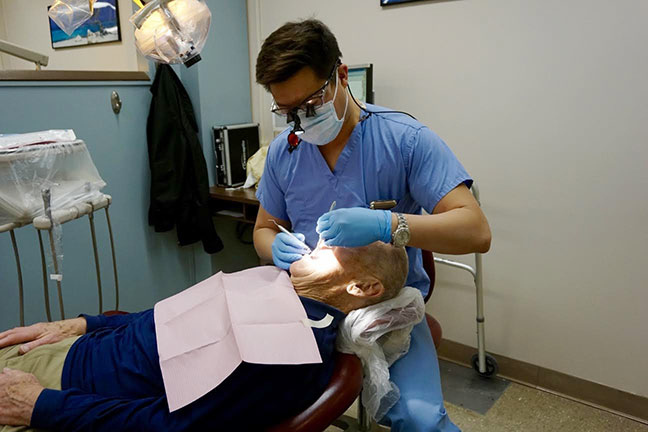 His father is a well-known family dentist in Melrose, Mass., and his mother is a professor at the Boston University School of Dental Medicine. And he won’t be the last. He has a younger brother who’s a first-year student at BU Dental, and a younger sister who is considering dentistry. When it came time for choosing a dental school, the UConn School of Dental Medicine was little more than a name on the list of institutions in the Northeast. Pan chose UConn over BU, Tufts and Columbia. He describes his experience as a UConn dental student as tough and arduous. “When they say in orientation this is not an easy program, they mean it,” Pan says. One of the things he’ll remember most about the UConn School of Dental Medicine is the class size. Pan is one of 35 students who make up the Class of 2016. Because they got to know each other so well, he says they will have a network of people they can call on for questions and rely on as they enter the profession. Pan says he’s always wanted to be like his father, and always wanted to work with his father. And that’s the plan: a year in BU’s general dental residency, and then back to the two-story building he grew up in, with Dr. Nelson Pan’s practice on the ground floor. Only this time, father and son will practice side by side. 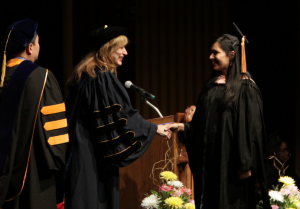 On May 9th UConn Health celebrated its 45th Commencement for 150 members in attendance of its Class of 2016 at UConn’s Jorgensen Center for the Performing Arts in Storrs. In total UConn Health graduated 192 students. UConn President, Susan Herbst, congratulated each graduating UConn medical, dental and graduate school student (Photo by John Atashian). 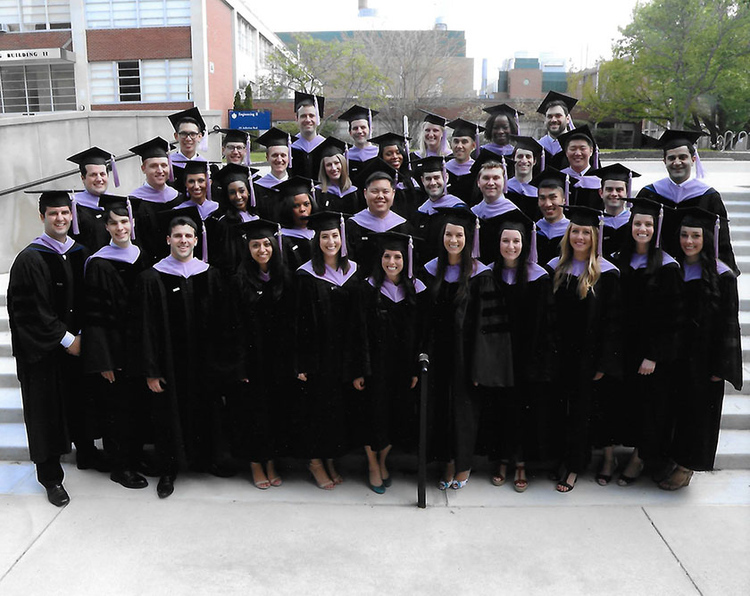 The graduates of the Class of 2016 included 82 new doctors and 35 new dentists. This brings the total of UConn Health produced physicians to 3,398 and 1,620 dentists since 1972. UConn’s Graduate School also issued 27 Ph.D. degrees (including 2 dual M.D./Ph.D. degrees) and 53 master degrees (including 3 dual M.D./M.P.H. degrees) for Master of Public Health, Master of Dental Science, Master of Science in Biomedical Science or Clinical and Translational Research, and Doctor of Philosophy in Biomedical Science or in Public Health. Herbst bestowed an honorary degree of Doctorate of Humane Letters upon Commencement Speaker Charles Osgood, a 45-year veteran newsman, a two-decade CBS Sunday Morning anchor, and radio commentator of “The Osgood File.” This honor adds to his countless accolades for journalism excellence ranging from Emmys to Peabodys to national hall of fame inductions for broadcast, radio and cable. 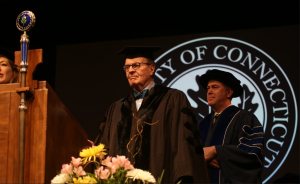 2016 UConn Health Commencement Speaker Charles Osgood of CBS Sunday Morning (Photo by John Atashian). “You are off to a great start. 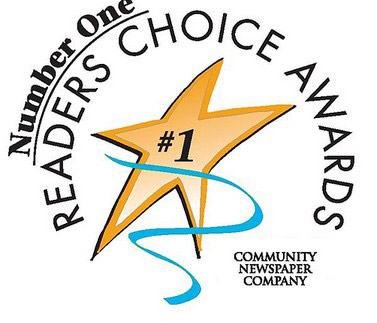 Congratulations and keep up the good work,” said Osgood. 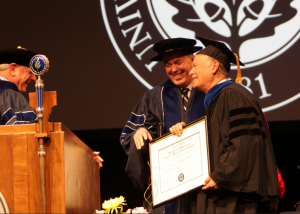 Dr. Marc Lalande receiving UConn Health’s Board of Directors Faculty Recognition Award (Photo by John Atashian). 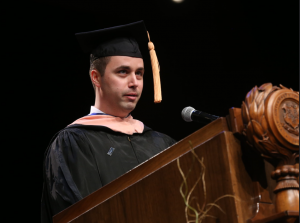 Student speaker Daniel Ray of The Graduate School (Photo by John Atashian). 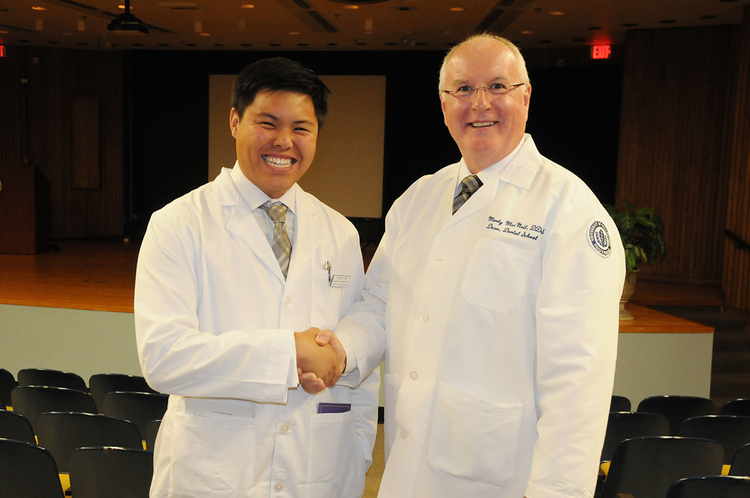 UConn School of Dental Medicine student speaker Jeffrey Pan (Photo by John Atashian). 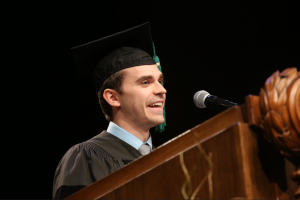 UConn School of Medicine student speaker Alex Hennessy (Photo by John Atashian). 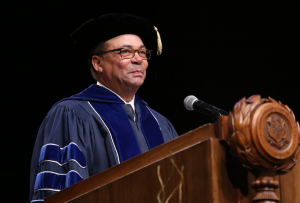 During Commencement Dr. Marc Lalande, professor and chair of the Department of Genetics and Genomic Sciences at UConn Health was awarded the Board of Directors Faculty Recognition Award for his outstanding contributions to research, teaching and mentoring. Also, a student speaker from each of the medical, dental, and graduate school classes spoke. Sanford Cloud, chair of the UConn Health Board of Directors shares his congratulatory remarks (John Atashian).